Reliable liquid filtration is essential to efficiency and quality management in sanitary processing operations. 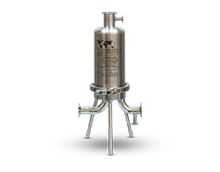 Our single round, sanitary filter housings and replacement components for the pharmaceutical and bioprocess industries are engineered to minimize contamination in a wide range of applications. Inline, T-style and custom designed filter housings, as well as a variety of inlet/outlet, drain and vent connections are available. Our filter housings feature durable construction for long-lasting performance. Occasionally, a component will need to be replaced to extend the service life of the housing. We offer replacement components for compatible filter housings, including plunger valve kits, clamps and clamp gaskets. Our stainless steel, sanitary filter housings utilize 316L stainless steel for all wetted surfaces to ensure the highest level of hygienic filtration. A variety of configurations (inline, T-style and custom), inlet/outlet connections, drain connections, vent connections, and elastomer seals make the filter housing adaptable to many application requirements.